See the CONTRIBUTION BONUSES below! Your contributions are TAX DEDUCTIBLE. Violence, terrorism, natural disasters, public crises are all too common in today’s world and they are increasing. The local church must respond with compassion and hope, meeting immediate needs when we can. But is there more we can do? I’m Scott McElroy , author of Creative Church Handbook and director of the non-profit New Renaissance Arts Movement . I believe the arts and creativity provide unique and powerful vehicles to help local churches respond and convey God’s heart in times of tragedy and crisis. 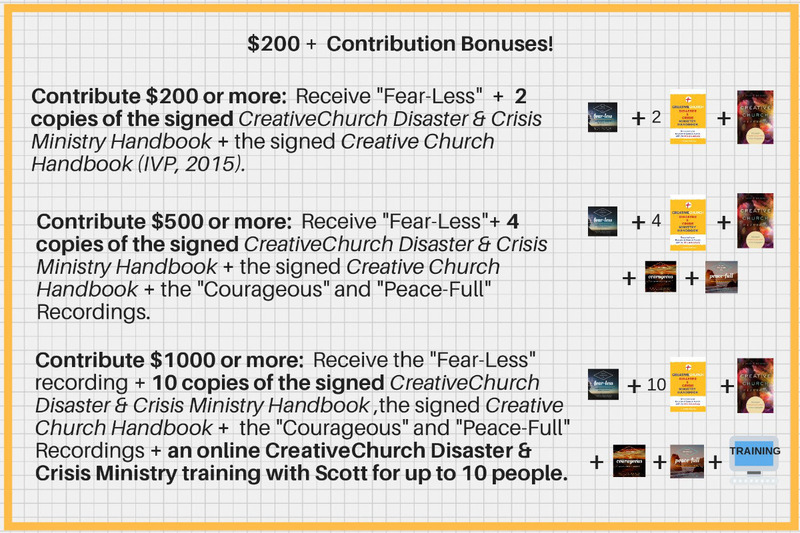 I'm asking for your funding help to complete an important new resource, the CreativeChurch Disaster and Crisis Ministry Handbook, that will detail this powerful form of ministry. "I really want to be encouraging of what you’re doing. I think the arts have an important role and it’s been underdeveloped, especially in the church. If you think about how people make sense of going through a trauma or if you look at the US when we’ve responded, the arts are helping us understand what’s going on, and make meaning, and give hope. So, I think it’s so important what you’re doing and I’m excited about this project you’re working on." 1) Engaging the arts within our local churches to help congregations process and intercede for disasters and crises both near and far. Jesus told us to not be anxious, but to have compassion on those who are hurting. We can’t remain disengaged from the suffering that is going on in the world. Through the arts, creativity, and beauty, we can mourn with those who mourn, empathize with suffering, and intercede right where we are. 2) Engaging the arts in outreach ministry efforts during the recovery and rebuilding phase after a disaster or crisis. Local churches can offer creative outreach ministry remotely or on the ground that brings beauty in devastation, hope in tragedy, caring in in times of despair. The arts and creativity are proven to be effective vehicles for healing of trauma, and the sharing of God’s love, peace, and grace in ways that can be felt and experienced, slipping past the intellect and penetrating the heart. This new book will provide practical frameworks, ideas, and case studies for the uses of the arts in church outreach ministry in the recovery and rebuilding phase after a tragedy. The majority of disaster relief in most crises comes from faith-based organizations, and yes, the local church should step in with supplies, manpower, materials, and finances when we can in disaster and crisis situations, to minister the dire and immediate physical needs. But God's plan is even bigger than meeting immediate physical needs. He is the God who IS creativity, beauty, healing, and restoration; the God who brings beauty from ashes. He designed the arts and creativity to convey these aspects of his character; bringing hope and healing, beauty and compassion to spirits, souls, and emotions in times of crisis. 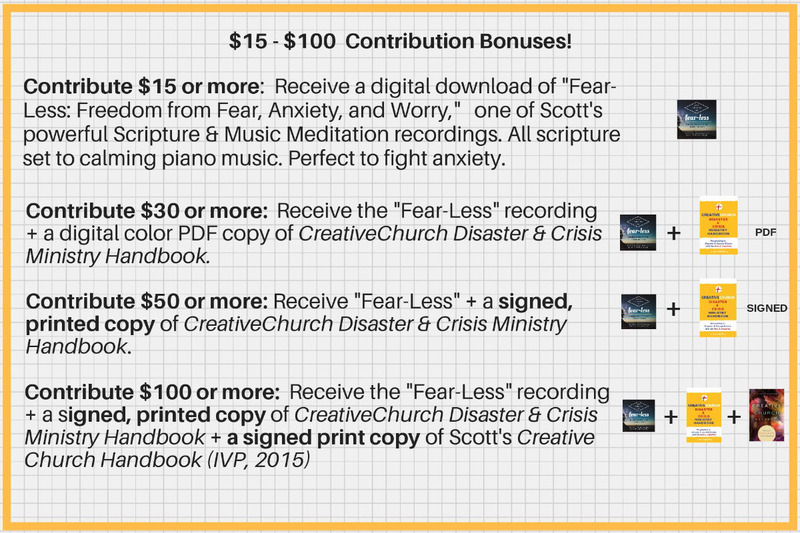 The CreativeChurch Disaster and Crisis Ministry Handbook will help churches everywhere respond and minister more effectively through the use of the creativity and the arts when disaster and crisis hits. Would you help us make this important resource available to local churches all over the world by contributing now to our go fund me launch campaign? Your contributions will be sent through the New Renaissance Art Movement non-profit, (a department of ACT Intl .) making them tax deductible. Your contributions will help support the many months of extensive research, interviews, case study gathering, editing, and writing required to complete this project. Without this support I can not allot the time required to complete the book. Yes, this chart is quite busy! If you have any questions, please email me: Scott (at) TheNewR.org . Blessings, and thanks for your support! Dr. Jamie Aten, Director of Humanitarian Disaster Institute and Author of Disaster Ministry Handbook had this to say about CreativeChurch Disaster & Crisis Ministry Handbook: "I really want to be encouraging of what you’re doing. I think the arts have an important role and it’s been underdeveloped, especially in the church. If you think about how people make sense of going through a trauma or if you look at the US when we’ve responded, the arts are helping us understand what’s going on, and make meaning, and give hope. So, I think it’s so important what you’re doing and I’m excited about this project you’re working on." Here is an example of one church worship leader's response to a disaster. The song helped him and many others process the trauma and trust in God's healing restoration. CreativeChurch Disaster & Crisis Ministry Handbook will help churches activate artists like Cripsin in our congregations to create work that responds to current events, and that helps our congregations intercede and heal. Just a few more days left before the deadline. Mindy from Indianapolis donated $50 cash, so I've adjusted the goal down! Thanks so much for helping make this new ministry resource a reality!